My husband is an adventurer and he likes to fish. Seriously, I’m glad that he has the chance to go off into the wild and I know he is experienced and smart about being out there. Still, I like to express my concerns. He makes me laugh with his responses. Here is the type of conversation we have about these things. My husband and his friend want to go to Alaska to fish for salmon. 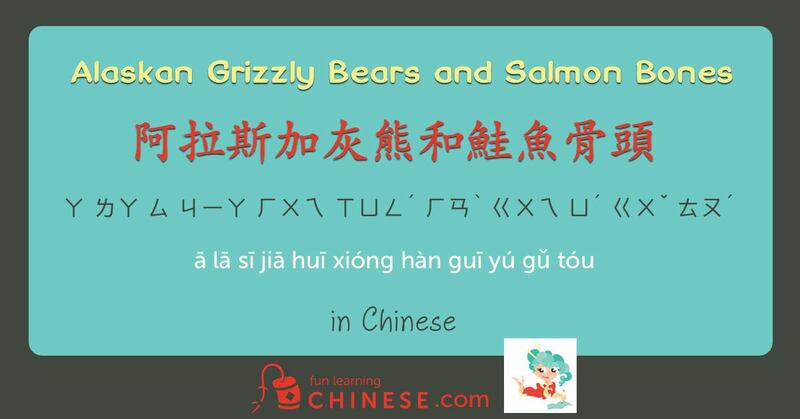 Alaskan grizzly bears also love to catch salmon to eat. I told my husband: Please, don’t get eaten by a grizzly bear! One more time I recommended to him: Remember! All you need to do is throw the fish to it, that will take care of it! While you are fishing for salmon, you still need to be careful and pay attention to look for a grizzly bear that has come over. He promised me he will be very careful. I don’t want to go to Alaska to look for your bones. Hopefully there will not be anything more exciting to add to the story! ❷ You may have noticed that there is an adjective marker in this sentence, but not in the title. My tutor says that in the title it becomes more of a term, so doesn’t need the adjective marker, even though it is translated the same way in English. For more on this, try reading The Grammar of Chinese Color: When to Use 藍色的 or 藍色. ❸ Just like the English word by, the Chinese 被 indicates a passive voice. In this sentence, I am speaking to my husband about something that he would be on the receiving end of, not an action he would be taking himself. 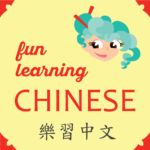 ❹ Even though guarantee is not a verb we normally add an -ly to, the grammar of it in Chinese allows that. However, it sounds better to translate it assuredly, since assure is a synonym of guarantee. ❺ 唯一 will always be an adjective referring to something so it will always have the after it 的 after it.